Doug Jones pulled off a surprise win in Alabama Tuesday night. Yes, even with the sexual assault scandals following Roy Moore, Jones's victory was still considered an upset because no Democrat has won a Senate seat in the Heart of Dixie in over two decades. His win was convincing - at least a 1.5 point margin, well above the margin it would take for an automatic recount, per state law in Alabama. Still, Moore refused to concede. 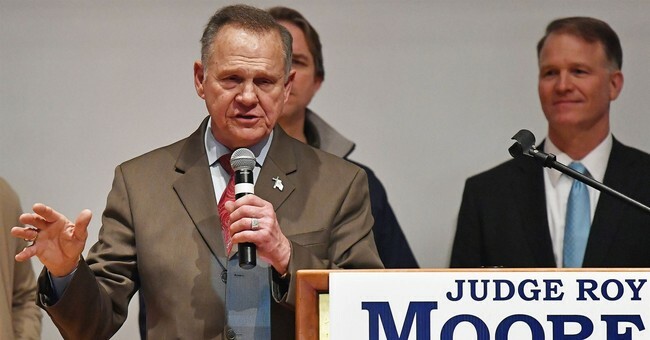 “What we’ve got to do is wait on God and let this process play out,” Moore said late Tuesday night, after all the media outlets had called the race for Jones. The Alabama GOP is not encouraging this show of resistance. It's time to call it a day, they suggested late Tuesday. “Now that this race has ended, may this holiday season of peace, love and hope resonate with everyone, regardless of one’s political affiliation," Alabama Republican Party Chairman Terry Lathan said. "We respect the voting process given to us by our Founding Fathers," he added. Republican leaders are echoing that sentiment. Be humble and acknowledge defeat, former Arkansas Gov. Mike Huckabee instructed Moore. Even President Trump, who endorsed Moore late in the race, congratulated his opponent on a hard fought win.